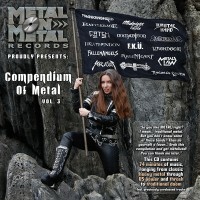 TITLE: "Compendium of Metal Vol. 3"
3. NOMAD SON "Empyrean Fade"
4. FALLEN ANGELS "The Gates of Irony"
5. SKELATOR "Birth of Steel"
6. HEATHENDOM "Endistancement by the Null Position"
7. WISHDOOM "Guardians of Steel"
11. SESTA MARCONI "Rock and Roll Voodoo Style"
12. BATTLERAGE "Battlefield Belongs to Me"
13. MIDNIGHT IDÖLS "Necropolis (City of the Dead)"
14. F.K.Ü. "Phantom Killer Attack"
15. METAL LAW "Metal Law"
16. FRANKENSHRED "Evil Shred Part 3"
You CAN'T get more metal than this! 74 minutes of music ranging from classic heavy through US power and thrash to traditional doom - and some hard rock and power/prog metal added for a good measure. Check out previously unreleased songs (FALLEN ANGELS, SKELATOR, HEATHENDOM and a live track of NOMAD SON from their 2009 "Light of Doom" tour), songs from the new albums of just signed bands (MORTALICUM and RAGENHEART) and songs from the already released CDs! 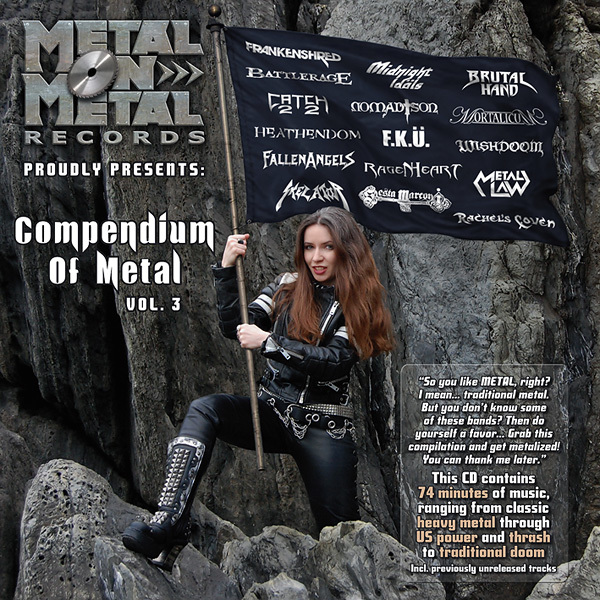 Get this fine selection of traditional metal for half price or less (if you order other CDs)!